Rugby Town Juniors deservedly lifted the Joel Richards Youth Cup at Sutton Coalfield last Thursday. In front of Gordon Strachan and a healthy looking 200 plus crowd, the team performed to a exceptionally high level to overpower a stubborn Tividale. Town went on the attack from the start and chances came within the first five minutes with McClintock and Redhead finding room to shoot from angles, but going wide. The Tividale keeper, who earned the man of the match award, was again in action saving a close-range header from Harris and the follow up from JC Vertigo. It was on 44 minutes when the deadlock was broken with Jordan Iverbru powering his way past two defenders and setting up Luke Jones who finished strongly. It was a goal fully deserved and the nerves in the team disappeared. The second half of the game was much the same with the Kilsby Lane youngsters providing the possession and Tividale defending stoutly. In one of Rugby’s attacks Jac Redhead shot and the ball went in but bounced back off the angle bar and whilst the Rugby lads were celebrating Tividale moved up the pitch with no defenders in sight and fortunately for Rugby the forward player was flagged offside. However ten minutes later Town wrapped the tie up when Jac Redhead played a one-two with Isa Abraham and then he beautifully curled a 20-yard shot around the keeper to the delight of his team mates. A great season for the youth was capped off by this first win in the County Cup. 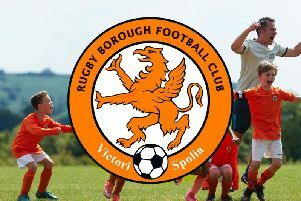 The team also reached the semi-final of the League Cup losing out to Stourbridge and the same in the League as a strong Stour team took the title.